"Hey! It's cat and dog day," I told my kid at breakfast. “That is not what you said,” I snorted. “Um-hmm,” I mumbled through a mouthful of coffee. “It’s when you mix up a letter in two words and put them in each other.” He explained. I looked at him. “Okay,” I said. “Spoonerisms are real.” He insisted. I know my child. I believed him. But, hell, I’m a writer. I write. Um...I got my degree in writing. Which I will now use to clean my windows. Next year. Why does he know this and I don’t? And, I might add, this is not the first time I’ve been bested by my 7-year-old son. After breakfast, it was Google-time. I just love Wikipedia. And here is what Wiki had to say about spoonerisms. A slip of the tongue, a twirly-whirl of consonants. Shel Silverstein even wrote a book composed almost completely of spoonerisms. 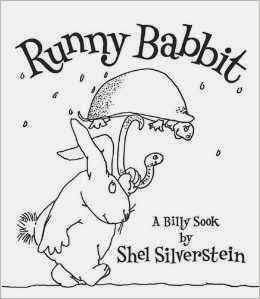 Runny Babbit: A Billy Sook. How did I not know this? I often have to overcome major embarrassment to write these blogs. And I don't mind. Sometimes it's just awesome kaving hids.